Regional producer of baked goods utilizes Samsara Routes feature and Time on Site Report to maximize driver productivity, improve operational efficiency, and boost customer satisfaction. Dora and Joseph Schwebel started baking bread in their Campbell, Ohio kitchen in 1906. At first, they went door-to-door to sell bread to their neighbors. As their reputation for freshness and quality spread, the Schwebels turned to horse-drawn wagons and, eventually, trucks to expand from their local neighborhood into northeastern Ohio and beyond. Today, Schwebel’s is headquartered in Youngstown, Ohio and has become a major distributor of baked goods in the Midwest. Schwebel’s uses seven production lines to bake three to four million pounds of bread and buns every week, operates 34 sales agencies and retail outlets across seven states, and services customers in a ~90,000 square mile area with its in-house delivery fleet. Although many aspects about the baking industry and customers’ tastes have changed in the 112 years since Schwebel’s founding, one thing has remained constant — Schwebel’s commitment to excellence. To ensure that customers receive products of the highest quality, every loaf and bun that comes out of the oven is delivered directly from Schwebel’s bakeries into the hands of its customers. 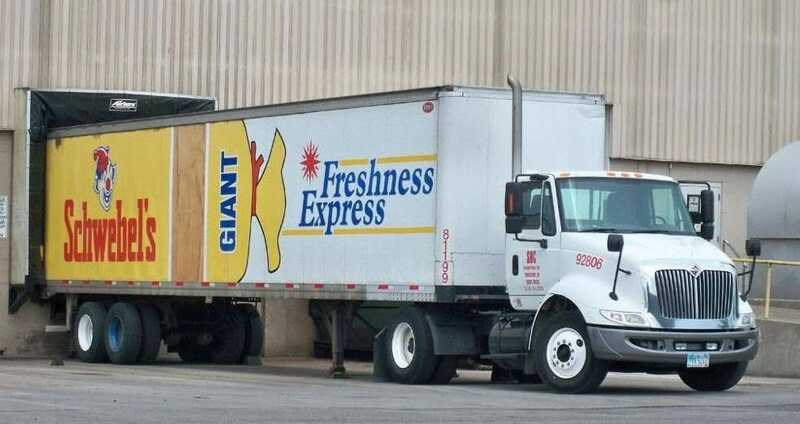 Every day, freshly baked bread and buns are loaded onto 78 tractors and 105 trailers on-site at Schwebel’s bakeries in Youngstown, Hebron, and Solon. The baked goods are transported to sales agencies up to 350 miles away, as far as Syracuse, NY, Indianapolis, IN, and Morgantown, WV. The final leg of the journey is completed via 300 route trucks, which make local deliveries from each sales agency straight into the hands of eager customers. Orchestrating the on-time delivery of millions of pounds of product across such a large market area is no easy feat. Enter Adam Schwebel, Vice President of Operations and fourth-generation bread man. Adam oversees all manufacturing and distribution functions for the company and considers technology critical to align activities across 1,400+ employees, maximize driver productivity, and uphold customer satisfaction. Because of Adam’s leadership, Schwebel’s has long been a pioneer of fleet management technology; in fact, Schwebel’s adopted electronic logging devices over a decade before they were mandated by the FMCSA. One of Schwebel’s challenges was maximizing driver productivity. It was not uncommon for routes to be delayed, as drivers made unplanned detours and stops on their way to sales agencies. Because Schwebel’s drivers are paid hourly, delayed routes result in higher costs and more unpredictable customer wait times. Schwebel’s previously relied on a passive GPS solution to track drivers’ routes; however, data from that system could only be synced via WiFi, which could only happen once deliveries were complete. As a result, the distribution team only saw drivers’ routes and stops at the end of the day. It was difficult to see when drivers deviated from their routes, where they tended to go off course, and how long they were delayed. By the time the distribution team noticed deviations, routes were complete and there was no way to make up for lost time. Adam knew that it was time to invest in a more robust solution. Adam and the Schwebel’s team evaluated seven to eight GPS tracking solutions to replace their previous one, but none seemed quite right — they were either too expensive, too complex to use, or didn’t have the right functionality. As soon as Schwebel’s undertook a free trial of Samsara’s fleet management platform, however, they knew that Samsara was the right choice. “Samsara was the only system that got buy-in from both our managers and drivers," Adam explains. "The ease of use is excellent, and the reliability is proven.” Not only did Samsara provide the live data that Schwebel’s needed to drive efficiency across its entire fleet operations, but it was also affordable, reliable, and easy to use. First, they use Samsara’s Messaging feature to immediately communicate with the driver, investigate the cause behind the delay, and help the driver get back on course. Second, dispatchers utilize Samsara’s powerful Routing feature to estimate the driver’s new arrival time and proactively notify the sales agencies. In addition to helping Schwebel’s improve its fleet operations in real-time, Samsara helps the company identify other opportunities for efficiency by analyzing historical trends in fleet and driver performance. With the Time On-Site Report, for example, Adam and his team can see whether drivers make a habit of spending time outside the parameters of their delivery route. Armed with that data, they can more effectively work with the drivers to correct that behavior.